Each frame is .1 second apart. 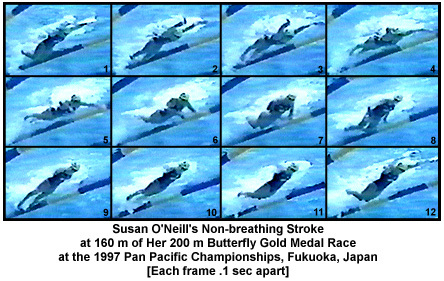 This series shows the consistency of Susan O'Neill's stroke over the past several years. During this time, there has been little change in best performance times which have usually been the best or one of the best in the world. At this stage of the race the swimmer is fatigued. That factor might compromise some aspects of technique. Susan O'Neill's stroke displays exaggerated vertical hip, kick, and shoulder movements. For example, in frames #3 and #4 the angle of the body is sufficiently steep to include her back and hips in the cross-sectional area that produces form resistance. Another exaggeration is the size of the kick. It is so big that the hips are driven upward (frames #1-#3). A considerable part of the swimmer's pull has to work to halt vertical movements. In frames #1 and #2 the hands outward scull to stop the "diving" motion of the shoulders and head. As a related consequence, the first part of the arm pull is devoted to changing the position of the shoulders as well as initiating propulsion (frames #4 and #5). It would be desirable to use a greater amount of these resources to develop propulsion. The compromise in propulsive movements also alters the timing and length of force application. It is possible that the latter part of the pull is shortened and the actual optimal force is timed to suit other actions. The dominance of other stroke aspects in the movement sequence normally leads to a reduction in propulsive efficiency. Streamlining is an essential part of any swimming technique. There is the possibility of improvement in this stroke. Several features are demonstrated which might be changed. In frames #1 and #8 the knees are dropped increasing form resistance. In frames #3 and #4 the shoulders are dropped well below the hips. In frame #13 the angle of the knees through to the shoulders is "steep" once again increasing form resistance. It should be remembered that Susan O'Neill is the predominant swimmer in this event, a "natural" performer who is still able to out-class many of her chemically enhanced rivals. But, on the other hand, she performs in an event that has not improved in ultimate standard for 18 years. While the above statements might sound like criticisms and faults, the suggested "remedies" themselves cannot be considered absolute answers. They are presented as possibilities and will only be validated or invalidated by appropriate instruction, inclusion in the swimmer's technique, exposure to sufficient practice, and then evaluation of benefit. As with any high-performance athlete, there comes a time when further technique "tinkering" is a futile pursuit. Elite athletes may demonstrate "faults" but they can be so entrenched in a movement pattern that it would be untenable to try and change them. It should be remembered that when changing technique in an elite athlete there is a period of time when the changes make performances worse rather than better. That is because movement changes in highly-skilled performers initially decrease overall efficiency. The length of time in this "difficult period" persists until sufficient practice is experienced to allow the new movement pattern to be executed at a level where it is an automated skill element. It is incorrect to assess the effects of technique change after a brief period. Performance advances in elite athletes usually occur after extensive development, instruction, and practice. Patience and discipline are hallmarks of both an athlete and coach when techniques are altered.